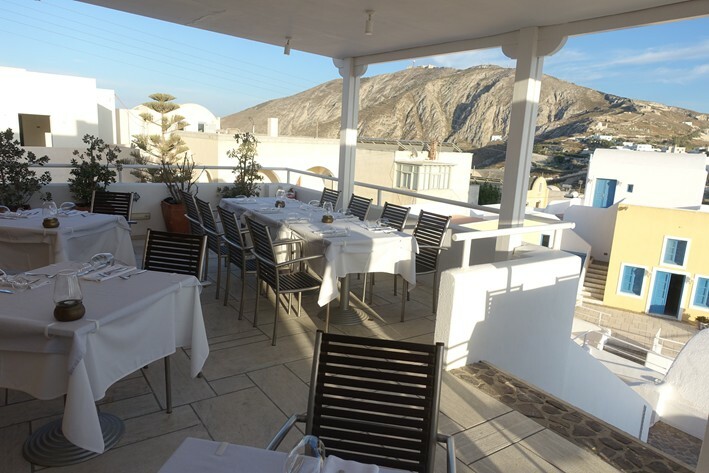 Selene (“Moon”) is in the village of Pyrgos, perched in a detached property on a hillside. The restaurant was established in 1986, but has been at these premises since 2010. 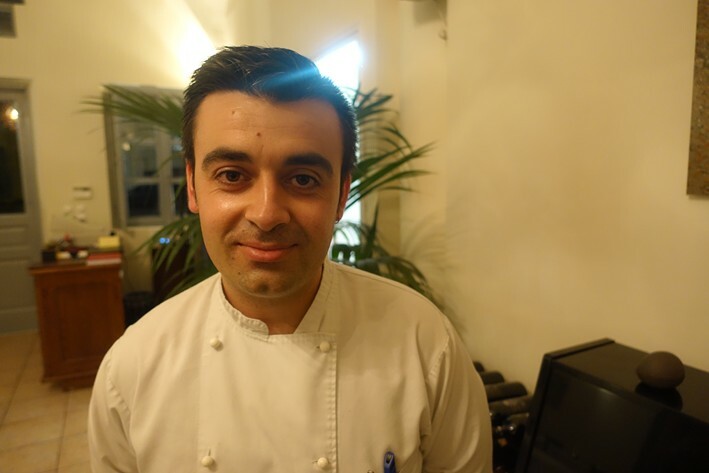 There have been a few head chefs over the years, but the current one is Panos Tsikas, who previously worked at Geranium, as well as in Peru, in addition to restaurants elsewhere in Greece earlier in his career. 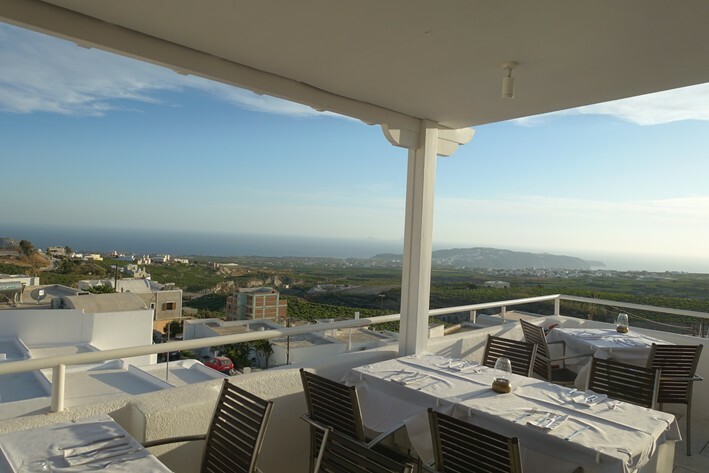 The indoor dining room is supplemented by an outdoor terrace, which has a nice view out over the island with the sea in the distance. It happens to be just a few hundred metres from one of the top wineries on the island, that of Hatzidakis, one of whose wines we drank tonight. 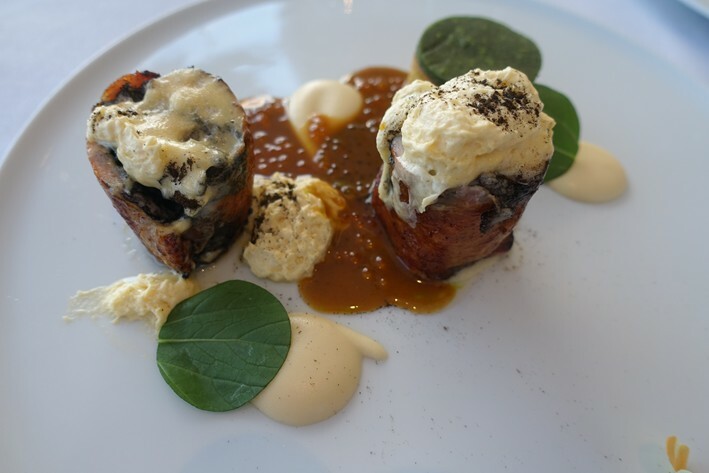 The a la carte menu offered modern but not wacky flavour combinations, with some use of local ingredients. The wine list was, interestingly, all Greek, featuring many wines from the island. Labels included Boutari Santorini 2017 at €35 for a bottle that can be found in the high street for €18, Gaia Assyrtiko Wild Ferment 2017 at €55 compared to its retail price of €28, and Sigalas Kavalieros 2015 at €80 for a bottle that will set you back €53 in a shop. 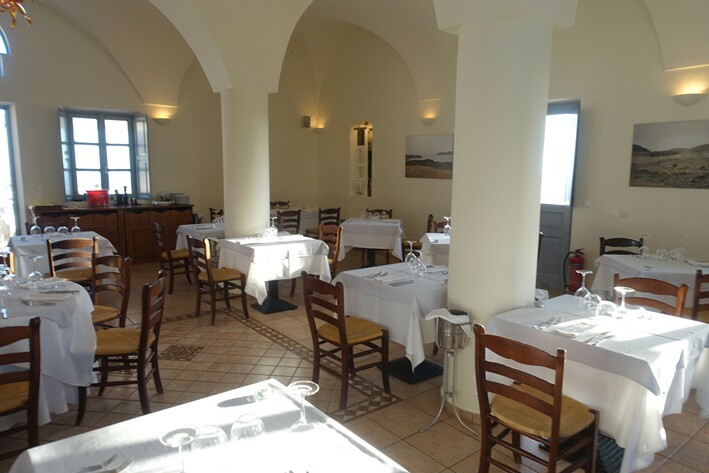 We drank the lovely Hatzidakis Louros 2015, a barrel fermented Assyrtiko that had considerable structure and complexity, priced here at €120 compared to its retail price of €72. An introductory amuse bouche was warm lentil soup poured over a “fish salad” that was croaker. The croaker had good flavour and the soup was smooth in texture and had a pleasing, earthy flavour that contrasted nicely with the fish (14/20). Bread was made in the kitchen here and included sourdough and pumpkin seed bread. My starter was sautéed strips of squid with fava beans and dried scallop with lemon confit, sautéed Brussels sprouts and mussel broth. 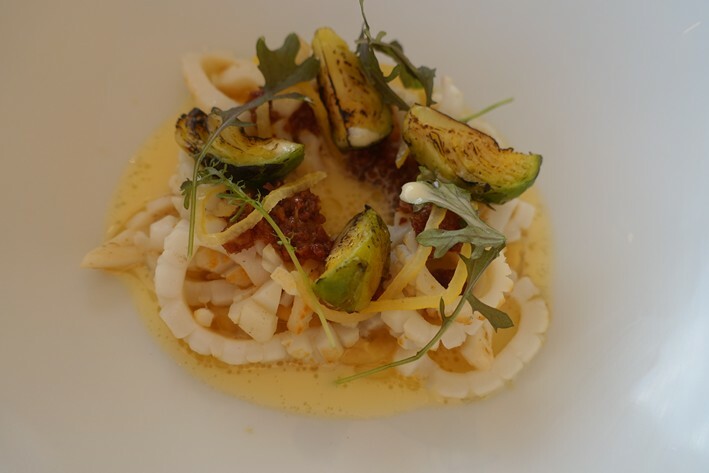 The squid was tender and had plenty of flavour, the mussel broth had considerable depth and the lemon brought freshness to the dish (15/20). 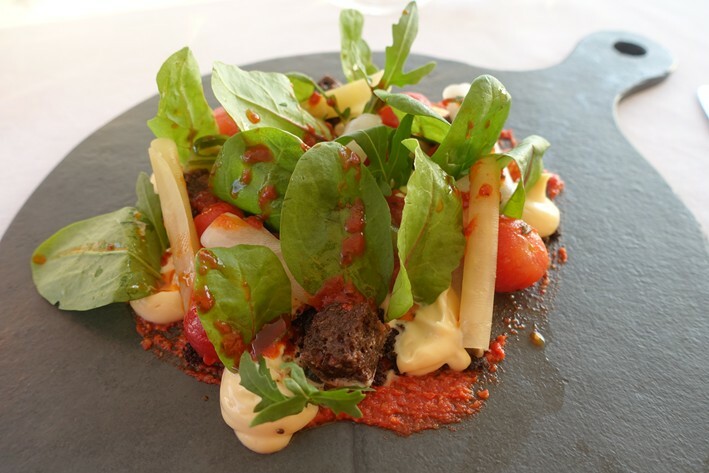 Santorini Garden salad comprised pickled yellow beetroot, pickled cucumber and pickled turnip with locally grown tomatoes, fava, carob bread, leaves, mayonnaise and sun-dried tomato pesto with chloro cheese snow. This was nicely presented and well balanced, the pickling juices working well with the cheese, the beetroot in particular excellent (15/20). 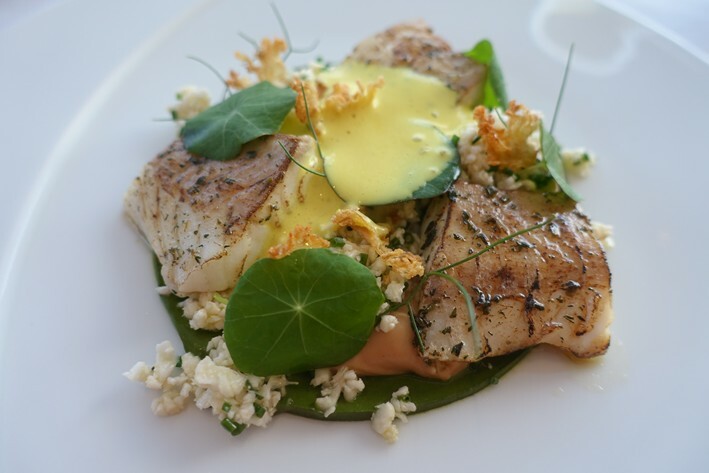 Sea bass was sautéed in clarified butler and served with cauliflower in three different forms: as a puree, a sauce and also as crisps, along with a pesto of Santorini vine leaves and fennel sauce. The fish was carefully cooked and went well with the earthiness of the cauliflower, the various textures working nicely together (15/20). Rooster wings were stuffed with the leg and breast of the rooster along with mushrooms, topped with porcini zabaglione. 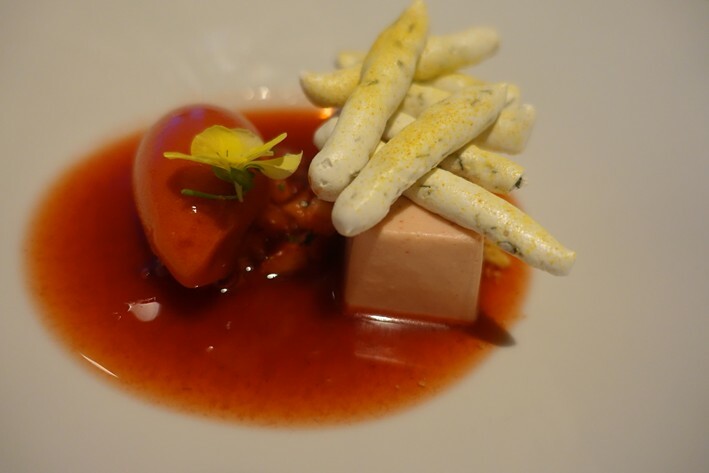 There was also caramelised potato puree and potato confit topped with parsley and lime, and a rooster jus with tapioca. The bird had lovely flavour and the mushrooms were a good accompaniment, the jus being quite intense (15/20). 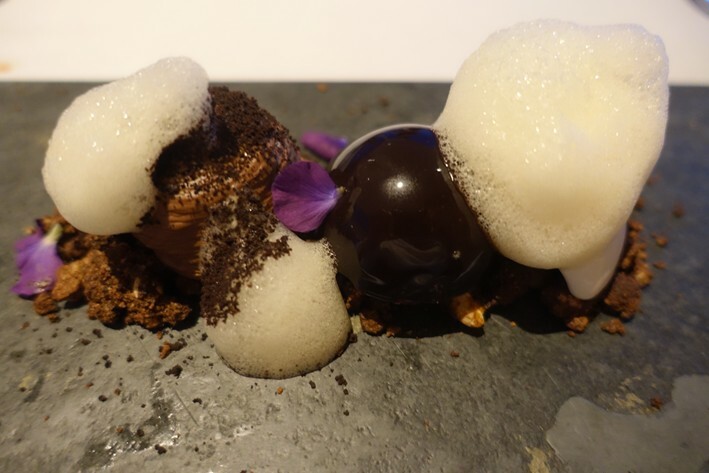 For dessert, chocolate cremeux (a smooth, dense pastry cream) was accompanied by chocolate crumble, chocolate ganache and a yoghurt sorbet with lime and foam made from a local beer. 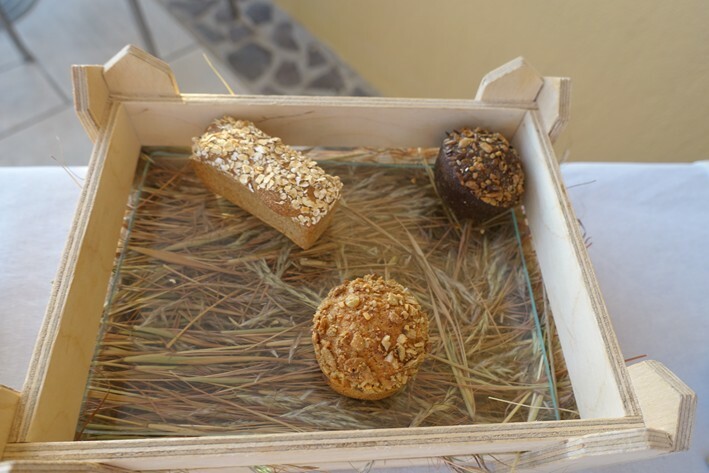 The chocolate elements were nicely made and had suitably rich flavour, the yoghurt and lime providing balance. I was less sure about whether the beer foam really added much (14/20). Strawberry cremeux came with strawberry tartare, strawberry sorbet that notionally had chilli though this was very subtle indeed, as well as strawberry consommé and a meringue with chamomile. This was a refreshing dessert with strawberries that actually tasted of strawberries, unlike the ones we generally encounter in the UK these days (15/20). Service was excellent, the staff attentive and giving the impression that they really cared about their customers. The bill came to €149 (£131) each. If you drank a more modest wine then a typical bill would come to around €115 (£101). 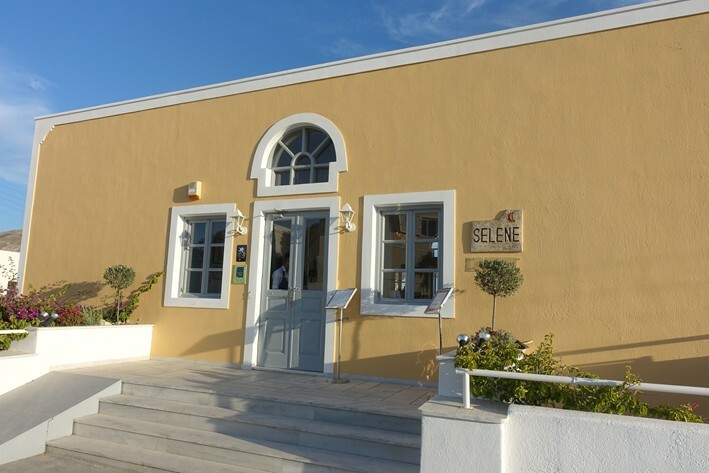 Overall I was very impressed with Selene, whose chef is skillful and assured. The menu was interesting, the dishes well executed and there was nice use of local produce. It was the best meal that we ate on the island, and far superior to the other fine dining restaurants that we tried here. It is not cheap, but welcome to Santorini, where very little is.